Every time we post a picture on Instagram of a beautiful bedroom filled with plants, we get some concerned comments from people that believe sleeping in a bedroom with plants is not healthy. We don’t agree with them and here is why: plants respire as humans do, emitting carbon dioxide at night as a reverse response to photosynthesis and converting carbon dioxide to oxygen during the day. Carbon dioxide and carbon monoxide are often confused. The names sound the same, they both are colorless and odorless gases, and at high concentrations, both can be deadly. In small amounts carbon dioxide is relatively harmless, while carbon monoxide is extremely dangerous. Maybe that’s where the confusion arises? Good to know, is that the amount of CO2 most plants produce at night is far less than humans and pets do. You could even say that sleeping with someone, in the same room or bed is less healthy (oxygen-wise) than sleeping in a bedroom filled with plants. The benefits of plants at home in general and in a bedroom in particular are countless. They make a room look more alive and your bedside table brighter. 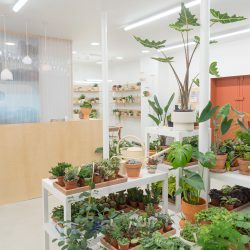 As you know if you read our #urbanjunglebook is that plants help to purify the air, by filtering indoor air pollutants like formaldehyde, trichloroethylene, xylene, toluene, and benzene. There is an entire Clean Air Study by the NASA with proven facts – have a look here. Also, taking care of your plants can help you wind down after a busy day. There are even studies that proove that by simply touching a plant’s leaf for 2 minutes, you reduce your stress levels! For a healthy bedroom climate, don’t count on plants alone: regular ventilation, fresh bed linen, a comfortable mattress and good pillows and an extra blanket if needed, help to make you sleep better and improve your overall wellbeing. Which plants are best for a bedroom? The Sansevieria plant, also known as snake plant, is a bedroom star: it tolerates low (bedroom) light and thrives off some (reasonable) neglect. Did you know that snake plants even convert carbon dioxide to oxygen during the night? This is proven by several studies and thus makes this plant the green star in your bedroom! Aloe Vera is a multi-talent in the home. Not only it looks sculptural and is boosted with beneficial effects, it is also a great choice for the bedroom. It removes benzene and formaldehyde from the air and its gel helps to sooth your skin – in case you have no cream or lotion at your bedside. Just sayin’. Another plant all-rounder is the Spider Plant or Chlorophytum comosum. It removes toxins from the air, is very very easy to care for, and it is non-toxic for your pets. So all you pet owners out there, get some Spider Plants for the bedroom asap! Plus they look so cool and almost out-of-space when they grow their own little plant babies hanging from long runners. So funky! Let a Philodendron grow along your bed canopy or a wall for instant style. Also, their leaves are heart-shaped which adds a subtle romantic touch to a bedroom! It also has air-purifying capacities and grows decoratively as a vine above your bed maybe? Why not! Areca palms are yet another great option for the bedroom. Why? Again they purify the air in your bedroom and are non-toxic for your pets. Additionally, they create an instant tropical vibe to your bedroom transporting you to lush jungles while you dream away. Waking up is like greeting a new day in a thriving jungle! You will sleep like a baby! This bedroom was styled with a Plants! throw blanket by Calhoun & Co from NYC, the Tiptoe x Bergamotte plant bench and the eve sleep x folk bedding set. Join us in London on January 31st for The Sleep Suite by eve sleep to learn how to dress your bedroom to sleep well! More info here! And now ‘greenify’ your bedroom and enjoy a good and healthy sleep! Good night, bonne nuit & gute Nacht!